Need an easy, hands-on way to practice addition facts or adding multiple numbers? 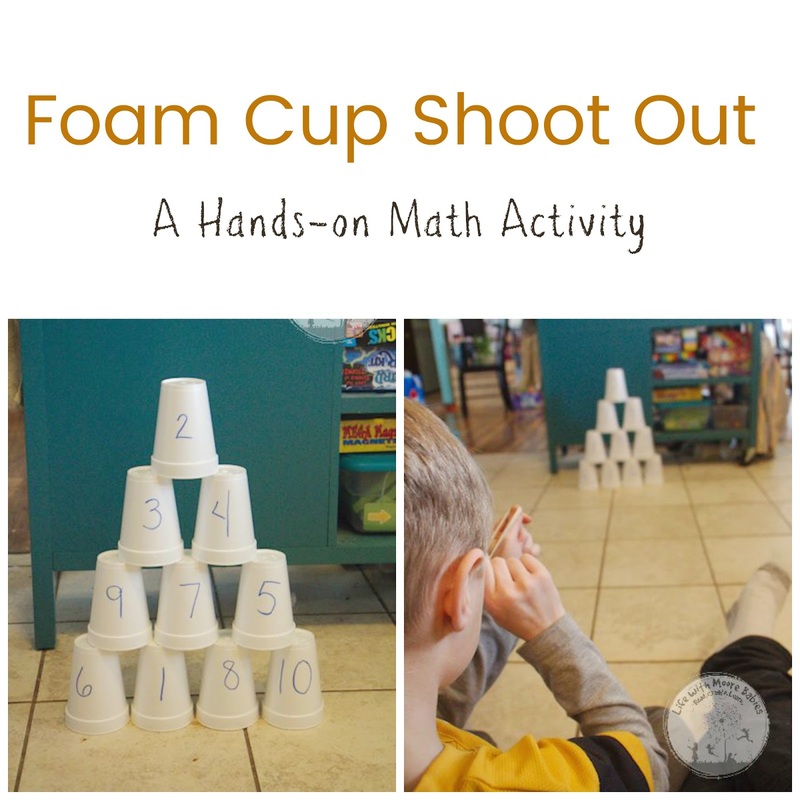 Try this Foam Cup Shoot Out! This is such a versatile, hands-on math activity that kids are sure to love. After all, what kid is going to turn down the chance to shoot a rubber band; it is almost irresistible! 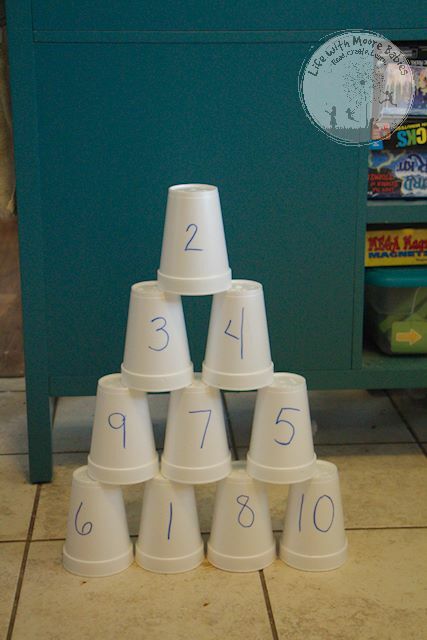 This foam cup math learning activity is so simple to put together! First, grab your sharpie and write numbers on your foam cups. These can be single digits, double digits, triple digits, decimals, or fractions. 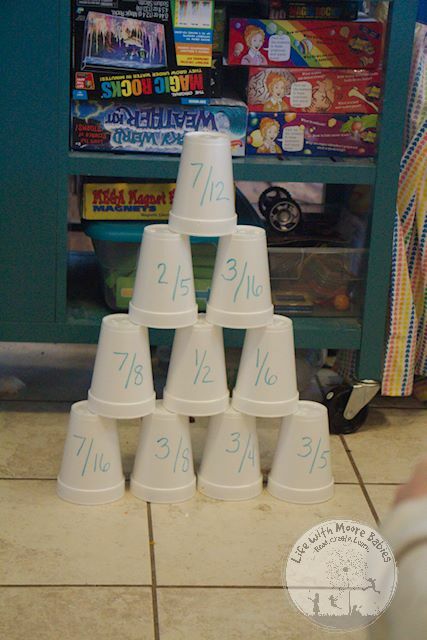 Now stack your cups in a pyramid, arm your student with rubber bands (or Nerf guns if desired), and you are ready to practice math. Now arm your child with rubber bands, and you are ready to go! Make sure they get instructions before they start shooting! You want them to aim towards the middle rather than knock the whole stack down. And make sure they know that they need to add the cups they knock off. All ready? Turn them loose with the rubber bands! Grab the ones that were knocked down, and let your little learner add them up. 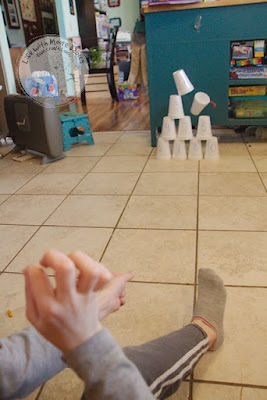 If you have a child, like one of mine, who insists they just cannot shoot a rubber band, especially when they prove it by hitting themselves 3 times instead of the cups, you can let them use a small Nerf gun. 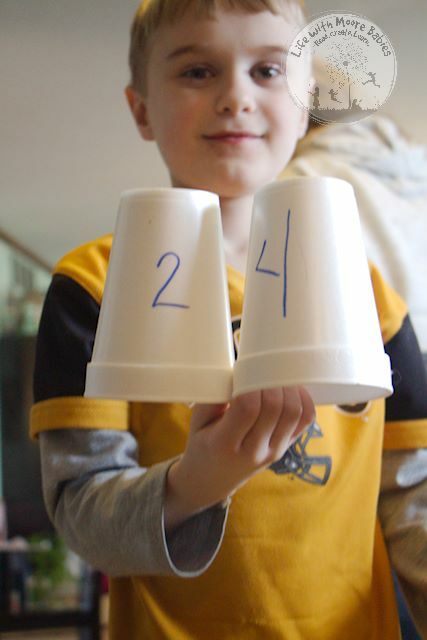 After they have successfully calculated the math problem, have them re-set the cups. This way they won't always have the same cups in the same place. 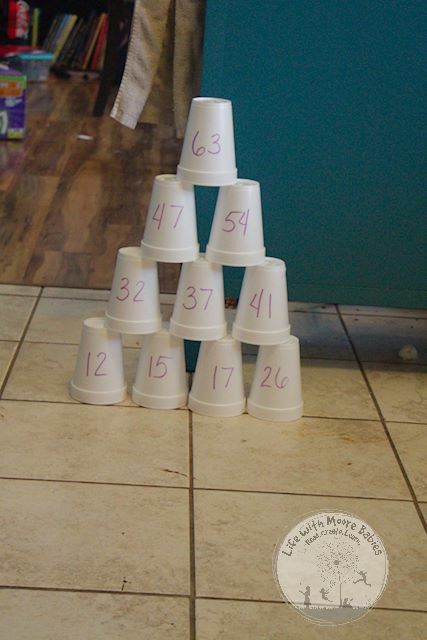 This hands-on math activity doesn't have to stop with single digits. My kids are all at different levels, so we had single digits, double digits, and fractions. I also had dry erase boards available for the longer math problems as well as the fractions. We quickly found that you didn't have to just use this hands-on learning activity for addition. You could practice multiplication, subtraction, or even division. This was especially true if the child only knocked down two cups! Once the kids knocked down some cups, I started asking the kids to perform all 4 basic math functions with the same cups! So when we had a 2 and 4 knocked down, I asked what is 2+4, 4-2, 2x4, and 4/2. This could be a little harder with multiple cups, but you can still easily do addition and even multiplication. If you have multiple kids working on math facts, you can also have them race! Basically, you have them shoot at the same time, then they can race to grab the cups, and perform the calculations. This would be great to get those competitive kids to practice boring math facts. After all, kids love an excuse to shoot rubber bands!